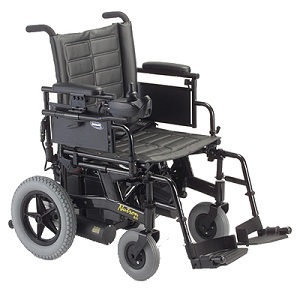 For a highly maneuverable motorized wheelchair in an attractive package, look no further than the Nutron R51. This exciting new model features dependable rear-wheel drive, enabling it to easily negotiate obstacles inside and outside the home. This electric wheelchair folds for easy transport when the consumer's active lifestyle takes him or her on the road. Portable cross brace frame folds to 13 for transport. Standard front: 8" x 2"
Optional front: 6" x 2"
17.75" seat-to-floor: 35" - 38"
19.75" seat-to-floor: 37" - 40"
350 watt motors: 250 lbs.